There was a hum of concentrated activity in the hall. There were groups of people either sitting or standing at rows of tables that had been pushed together, all staring spellbound at laptop screens, deep in discussion or sticking gaily coloured labels on partition walls. There were just over 200 participants from 27 nations taking part in the InnoGames Game Jam, held in Cologne at the Gamescom computer games fair in August 2016. All of them were working on games that focused on the subject of “masks”. And everyone was energised for there were only 48 hours left until the results had to be presented. Being creative under time pressure and having a lot of fun – this is the basic idea of game jams. The approach first came about in the USA, where, shortly after the turn of the century, computer game developers got together in small groups to design experimental prototypes. This joint improvising (“jamming”) started to attract more and more followers, in the meantime there are game jams in almost every country in the world, a lot of them also take place online. In Germany game jams are becoming more and more popular – almost every week somewhere in the Federal Republic there is some game jam event happening; the organisers are mostly game companies, universities or technical colleges. German game jams benefit from a growing independent scene. Not only in large cities such as Berlin, Hamburg and Munich are more and more start–ups popping up all over the place, all with small teams implementing original game ideas. For these start–ups, game jams are a welcome opportunity to meet with other representatives from the industry and studios. The InnoGames Game Jam in Cologne was one of the largest ever to be held in Germany. When the 48-hour deadline ran out, the participants had submitted a total of 39 games. A jury selected the best contributions, for example, a virtual reality game, in which a mask wearer hunts down a tiny figure (Panoptes) that is also player-operated. Or games for up to four participants, in which three sheep have to be wary of a disguised wolf (A Wolf in Sheep's Clothing). Game Jams come in all sorts of different forms. “The basic constant is a limited timeframe,” says Johannes Kristmann, “but that timeframe can vary between eight hours to a whole week”. Kristmann is the co-founder of Maschinen-Mensch, a start-up in Berlin. He has already participated in various game jams, including the online jam Ludum Dare and the Global Game Jam, which takes place in many countries at the same time. “Only recently was the German edition of the Alt Ctrl Game Jam held in Berlin – a jam that focuses on alternative input methods,” says Kristmann. The participants designed their own control devices, for example, musical instruments and fruits. Before they start, most game jams decide on a certain theme, which can then be interpreted quite freely like “escape” or “discovery”. Others take place at very specific venues, such as on trains, boats or in castles. As different as the jams may be, “The basic idea is that anyone can participate,” explains Kristmann – not only programmers, graphic artists or soundtrack composers, but also amateurs who are simply interested in computer games. Awarding prizes to jam contributions, as was the case in Cologne, is more the exception. The focus is not on competing, but on cooperating amicably and exchanging ideas and experience. “You can learn a lot from game jams,” says Kristmann. “Not just the pure craftsmanship, but also about project management and many human things.” For example, how to make compromises between one’s own ideas and those of others. Christiaan Janssen can only confirm this. Together with his colleagues Tobias Wehrum and Ivan Gabowitsch, the native Dutchman organises the traditional Berlin Mini Jam, which has been held on a monthly basis since the autumn of 2010. The particularly tight timeframe of eight hours facilitates the organisation, because, unlike in the case of events lasting several days, the organisers do not have to worry about finding accommodation for the participants. The Berlin Mini Jam takes place on Saturdays in a co-working space in the Berlin district of Kreuzberg. Janssen explains the schedule as follows: “At the beginning, we organise a short game to get the participants talking to each other. Then Tobias explains in his introductory speech what a game jam is basically all about.” Subsequently, the participants propose a number of topics, from which one is selected by majority vote. Then the actual jam starts: The participants form working groups, which usually comprise four to five members. “There are, however, always people who prefer to work alone,” says Janssen. After a brainstorming phase, the concrete implementation phase, i.e. the programming, the graphic design, the plot and the search for suitable sound effects and music begins. “At the end, every team shows what it has achieved in the eight hours on a projector,” says Janssen. It is an exciting moment in which the games are presented for the first time. 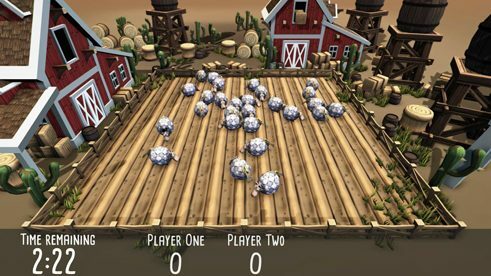 They do not necessarily have to be computer games – board and card games are also possible. But what actually happens with the games that are produced in the jams? “70 to 80 per cent of the contributions are not developed any further,” says Johannes Kristmann. However, some ideas are so good that they are developed into a marketable commodity by the participants. One example is TRI, the puzzle adventure game by Rat King Entertainment in Halle, which won the German computer game prize in 2015. However, many jam games are uploaded as prototypes on internet platforms like itch.io and are thus available to the general public. Sometimes the basic idea also reappears in another game. Kristmann assumes that the jam scene in Germany will continue to grow. He is also now active as a jam organiser and mentor who advises the participants. Together with Riad Djemili von Maschinen-Mensch, he is currently organising a game-jam series on “Politics and Art in Games” for the Goethe-Institut. It is to have toured through eight different countries by 2018.
works as freelance journalist in Berlin for „Spiegel Online“ „Zeit Online“ or „Der Tagesspiegel“. His focus is above all on technological issues and computer games.